Comic book artist Hugo Pratt is celebrated for combining fictional characters with historical fact in works like the best-selling Corto Maltese series. In “Lignes d’Horizons,” the Musée des Confluences brings Pratt’s work to life, the way he always saw it in his head. The sails stand guard at the entrance, their inherent movement stopped in its tracks by the ropes pinning them down. 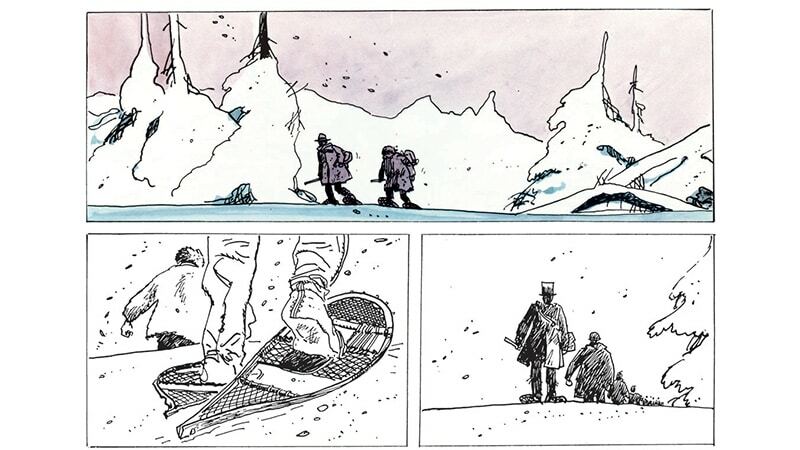 It’s Corto Maltese, trapped in time, frozen in a moment, and with him his life source and creator, Hugo Pratt, the adventurous dreamer who never ceased to travel and explore. At the entrance the life-size sails are the first artifact in sight, tied to the floor and ceiling in an ode to Pratt’s most famous comic book character, the sailor Maltese. But there are many more artifacts to come, for the Musée des Confluences has decided to do Pratt justice in treading a path it hasn’t been down before. In “Hugo Pratt, Lignes d’Horizons,” the museum is revealing the celebrated author’s world through a collection of his comics paired with the art and culture that inspired them. Combining the comics’ imagery with video, audio, animation, and real-life artifacts, “Lignes d’Horizons” creates a world all its own, one that crosses the boundary between fact and fiction, between the literary and the real, in the very same way that Pratt did. The exhibit unfolds around a wall backing the sails, surrounding guests in its knowledge, submerging them in its world. A cavernous showroom has been transformed into the story of hundreds of lives, intertwined by history, written down on the pages of Pratt’s 130 volumes, 29 of which are dedicated to his prized rough-and-tumble sailor. From the mysteries of Papua New Guinea to the Canadian “Grand Nord” and countless places in between, these old friends are on an adventure across the world, an adventure that begins right here in Europe. Pratt, an Italian native, was a constant wanderer, becoming in his life not just Italian but Argentinian, American, French, and Swiss. His adopted countries and cultures informed his stories and inspired him to explore elsewhere, giving birth to Maltese in an explosion of worldly curiosity. Inspired by the works of British and American creators, Pratt saw a vision of “bande dessinée” as a sort of written cinema, an artistic work that isn’t just about the words, that isn’t just about the pictures, but rather a composite of the two, with sound, color and personality all its own. He saw the full image, creating comics that read like films, and characters that reflected the readers who became them. Corto Maltese is Pratt’s greatest hero, a complex character born from Pratt’s own wanderlust as a collection of imagination and history. 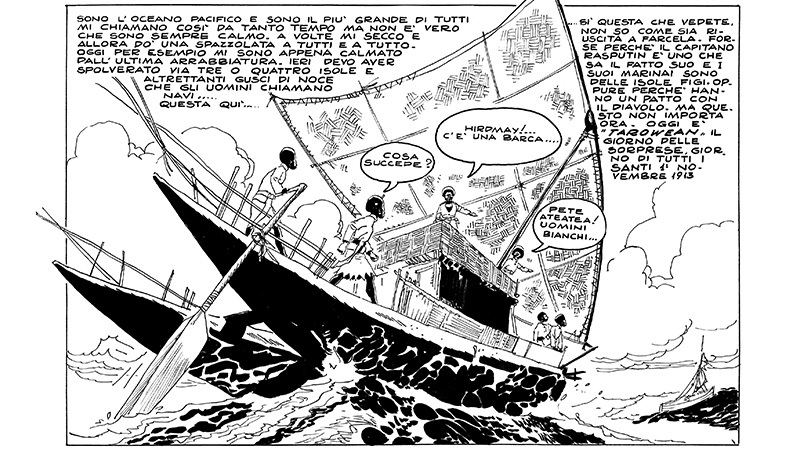 Weaving together fact, fiction, and inspiration, Pratt used Corto Maltese as a conduit to discuss historical, cultural, and political happenings around the world. The Corto Maltese series is widely recognized as one of the most successful comics of the 20th century. 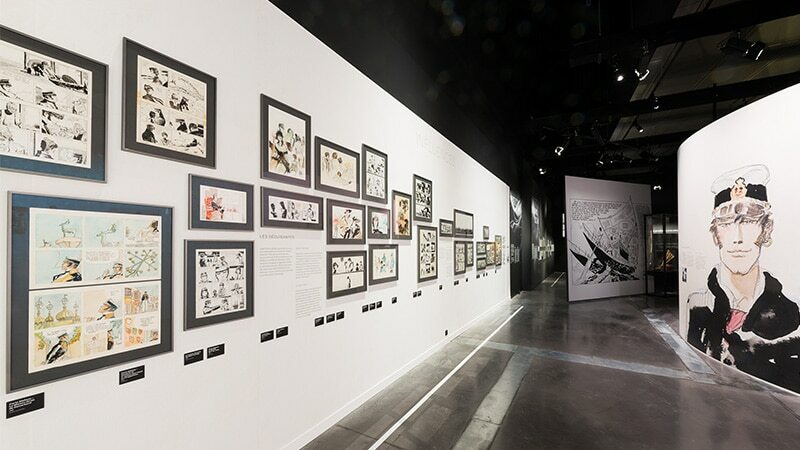 The Musée des Confluences exhibition pays homage to this legacy by bringing Pratt’s comics back to their roots in reality. Lights hang from the rafters of the industrious black room. Past the sails, old-school cinematic music brings to mind a cavalry charge scene, throwing listeners into the early 1900s. A portrait of Corto Maltese holds vigil over the photographs honoring the life of his great creator. Identical grey frames are filled with drawings, character sketches, and comic book pages. It’s the “Naissance d’un Héros,” the birth of the very hero towering over visitors from his position of honor on the entryway wall. From Pratt’s beginnings in the real world, the show moves into the realm of the imagined, intertwining the many cultures of Pratt’s comics into flowing exhibition sections. Scattered amongst the grand canvases depicting Pratt’s stories are masks, artifacts, and artwork taken from the Museum’s permanent collection, depicting the regions Pratt has drawn. 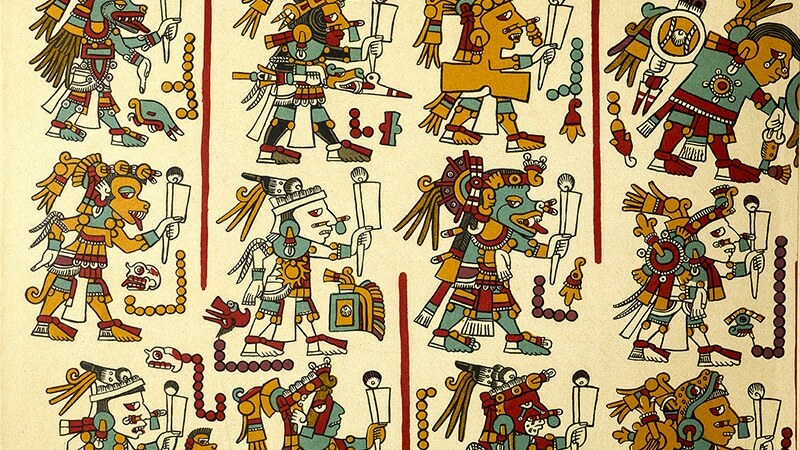 Among them are Oceania, the Amazon, pre-Columbian America, Africa, and northern Canada. In the story’s imaginary world, a dugout canoe and its six passengers forge through rough seas. Sitting beside it, and back in reality, is a mini-model of the dugout, the kind used in 19th century New Caledonia. This panel from the 1967 “La Ballade de la mer salée” sits next to a 19th century model dugout canoe. 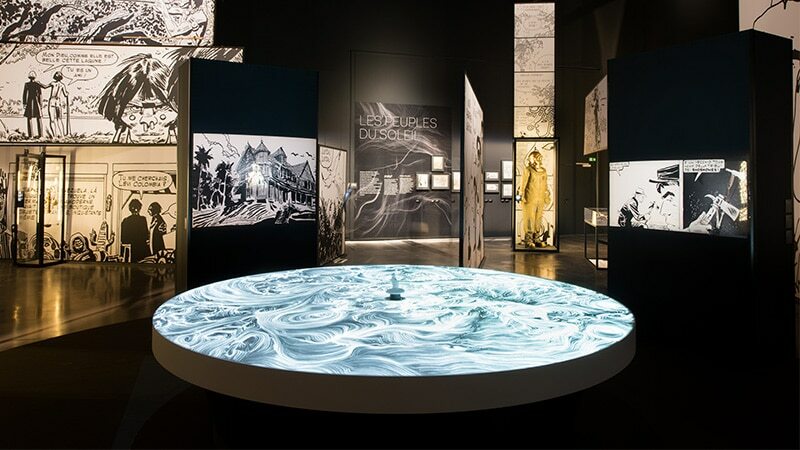 The Musée des Confluences exhibit mixes Pratt’s work with artifacts to showcase its historical accuracy. © Cong S.A. Suisse. All rights reserved. And so Corto Maltese’s adventure begins, under Pratt’s watchful eye, across the deserts and oceans of the world he seeks to know. The comics fill the walls, showing boats, jungles, native islanders, French and Italian, color and black and white. A “kavat” mask the size of a tall six-year-old opens the section on Oceania, next to a comic panel showing the same mask, detailed by Pratt’s masterful hand. Moving through the vast room, Pratt’s drawings become walls that surround and entrap viewers, pulling them into their world. You’re snowshoeing across the wilderness of northern Canada. You’re swinging on a vine through the jungles of the Amazon. You’re shooting arrows with the Native Americans of Virginia. A circular table fills a corner of the room. It’s an animated map of the world, swirling with weather patterns, ocean currents, or the paths of Pratt’s many characters. Click on an icon to see them speak, sharing their worldly wisdom with their visitors. From the black-and-white exhibition beginnings, the room begins to add more color. A Native American pauses on his trusty steed, painted in sunset colors on the stark white wall. The lights cast shadows, bringing him and his horse to life, as if they’re breathing before your eyes. A man, Jesuit Joe, rows his canoe under a tree, shedding its leaves with the turn of the fall. You could almost wave as he goes by, floating down the river to his next adventure. “Lignes d’Horizons” is a full-fledged expression of that imaginary world, of pure, magnificent, unfiltered creativity that spans cultures and eras and ideologies. It’s a showcase of the human experience, in all its differences and similarities, through the eyes of a lifelong traveler. It’s a choreographed dance between the imagined and the real, an exploration of one man’s treasure island that reminds us, through to the very end, to never stop searching for our own.